We’d love your help. 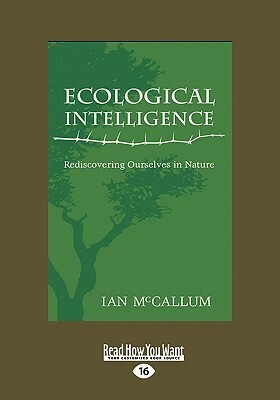 Let us know what’s wrong with this preview of Ecological Intelligence by Ian McCallum. To ask other readers questions about Ecological Intelligence, please sign up. Muy bien! I bought two copies, I liked it so much. One to keep, and one to share! Bought this book at kirstenbosch botanical gardens in Cape Town. It was sold in connection to an art exhibit entitled " Untamed", works aimed at reconnecting man with nature. Really striking pieces. I am not typically interested in hard biology. This book pulled me in because the author is a psychiatrist, naturalist, and poet. When it gets multidisciplinary, thats when i get really excited. Though it had some super scientific moments it was more of a manifesto and amazingly thought provoking. Ac Bought this book at kirstenbosch botanical gardens in Cape Town. It was sold in connection to an art exhibit entitled " Untamed", works aimed at reconnecting man with nature. Really striking pieces. I am not typically interested in hard biology. This book pulled me in because the author is a psychiatrist, naturalist, and poet. When it gets multidisciplinary, thats when i get really excited. Though it had some super scientific moments it was more of a manifesto and amazingly thought provoking. Actually read the book while on an 8 day cross country mobile safari through the national parks of Botswana. At 30 years old this was my first real experience in nature and with wild animals. Going into this experience I already had strong philosophical beliefs about life and religion which I won't go into here. This book was an amazing companion to my experience! I felt validated but my thoughts expanded. One of the few books I started but did not bother finishing after I got about half way. How come? Well to start with it consists of 2 completely different things. Ecology and poetry. The first one I am interested in, the second I am not. I thought it was an interesting idea, but in the end it did not work for me. On the poetry part I cannot comment as I have no idea of it. On the ecology part however I can. The reason for the second star is that the book was very thought provoking for me. I disag One of the few books I started but did not bother finishing after I got about half way. How come? The reason for the second star is that the book was very thought provoking for me. I disagree with the author on a few things, but in a good way that lead me to thinking a few interesting thoughts. However the further I got into the book the more I got annoyed. The first time I thought about quitting was the sentence: "if you believe this say quickly yes " about one of his ideas. If you are a scientist you do exactly the opposite. Check the facts, consider the implications and form a logical conclusion, not quickly, but thoroughly then you do not need to believe anything! In a word - Disappointing. I am a believer in the principles of Deep Ecology, treating every living organism and all forms of life as having the intrinsic right to exist, separate from their usefulness to mankind. I am also quite well acquainted with ecological concepts and the interconnectedness of living and non-living things on Earth. But when the discussion begins to veer towards the spiritual and intangible feelings of 'oneness' with other creatures I begin to tune out. The author is undoubt In a word - Disappointing. I am a believer in the principles of Deep Ecology, treating every living organism and all forms of life as having the intrinsic right to exist, separate from their usefulness to mankind. I am also quite well acquainted with ecological concepts and the interconnectedness of living and non-living things on Earth. But when the discussion begins to veer towards the spiritual and intangible feelings of 'oneness' with other creatures I begin to tune out. The author is undoubtedly highly educated and intelligent judging from his qualifications both as an MD and psychiatrist, and also artistically gifted in the realm of poetry. Perhaps there is some truth in the concept of psychic connections between all living things in what he calls a 'mindfield', my understanding of quantum physics being just too shallow to comprehend its repercussions. In any case, he did not succeed in convincing me. Other than one or two chapters that dealt with more tangible subjects like the evolutionary history of life and humans, the others took effort from me not to lose focus as they dwelt on the metaphysical and spiritual aspects of nature that make up 'ecological intelligence'. I did savor many parts of this book, especially McCallum's well-selected poems. The reason I didn't rate it more highly, however, is because sometimes I found his narrative overly reactionary as opposed to solutions oriented. I completely agree with his premise -- we are in desperate need of "ecological intelligence," but what I would like to learn more about is how such intelligence would look in actual practice, such as in systems design, or in everyday life. He spends most of his time delinea I did savor many parts of this book, especially McCallum's well-selected poems. The reason I didn't rate it more highly, however, is because sometimes I found his narrative overly reactionary as opposed to solutions oriented. I completely agree with his premise -- we are in desperate need of "ecological intelligence," but what I would like to learn more about is how such intelligence would look in actual practice, such as in systems design, or in everyday life. He spends most of his time delineating the need for such intelligence, and in pushing back against embedded perspectives. I'm already convinced. I want to hear more about how to live it! The middle-of-the-road rating doesn't reflect on the ideas in the book, which I completely agree with. However, they're not particularly new or original ideas, especially for the environmentally aware and nature/animal-connected generation. Add to this MacCullum's style of writing, which may be enjoyed by some, by wasn't really by me (at times a little corny, at times a little staid) and you get an "it's okay" summation. Perhaps having the privilege of meeting the author and hearing his approach made this book more meaningful for me. While much of the biology was familiar territory it is his concept of a 'mind field' that I find particularly compelling. Thought provoking in the extreme. Highly recommend this to those who have a concern about the planet and its inhabitants. Ian McCallum is a medical doctor, Jungian psychologist, wilderness guide, and founder of the Wilderness Leadership School in the Cape of Good Hope. He is the author of the novel Thorns to Kilimanjaro and a poetry collection, Wild Gifts. In the 1970s he played fullback for Springbok, South Africa's national union rugby team. McCallum currently lives in Cape Town with his wife, Sharon.